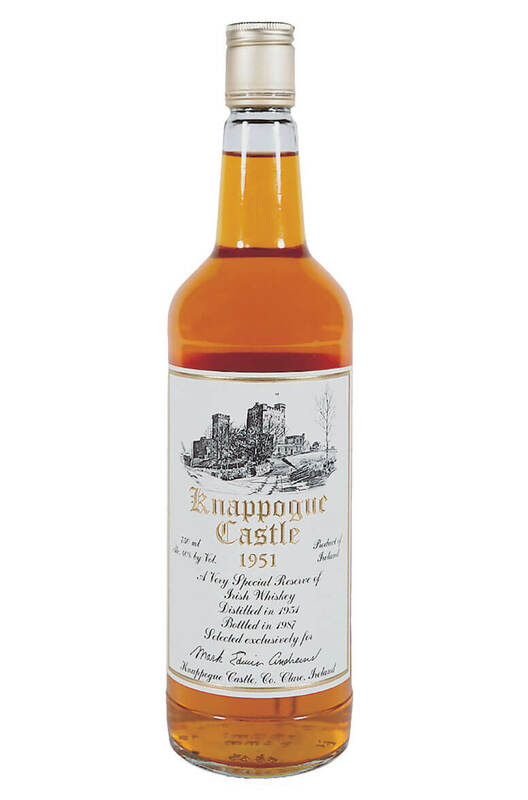 The 1951 Knappogue Castle now has a legendary status amongst Irish whiskeys. The old Tullamore Distillery closed permanently in 1954 yet some casks were liberated by various entrepreneurs for maturation. Mark Edwin Andrews was one of these people having returned to the land of his ancestors from America to live in Knappogue Castle in County Clare. He managed to source a number of casks from different vintages, most of these were given away as gifts or were used for personal consumption. After 36 years in casks he released the 1951 commercially in 1987. To this day the 1951 vintage of Knappogue Castle is still regarded as one of the finest whiskeys ever made, it is by no means perfect but its imperfections are what makes it so interesting! Old whiskeys can be an acquired taste and are not for everyone, expect to find lots of oak and spice flavours with this. Jim Murray's tasting notes Nose: A heady mix of overripe (almost black) banana, big oaky notes. Demerara sugar (slightly molasses, in fact), soft honey, ripe greengages and pepper. On a blind nosing, I might have considered this a rum. Just a few ripe barley notes pop through, but essentially when cold. Taste Big, booming start. Very rich from the off: attractively oily and mouthwatering, immediately showing an unmalted pedigree to the clean barley and perhaps a hint of oats. However, to the middle, there is a sweet, coppery, estery texture more attuned to Jamaican pot still. Finish Long, quite hard and brittle—as one would hope from a whiskey of this genre—and some of the deeper vanillas one might expect to find in an old bourbon. Chewy, with licorice and a hint of chicory. It is that estery, vaguely honeyed, oily copper pot rum that hangs on the longest. Comment A highly individualistic whiskey that refuses to take prisoners. Another year in the cask might have tipped this over the top. We are talking brinkmanship here, with a truly awesome display of flavor profiles ranging from traditional Irish pot still to bourbon via old Jamaican pot still rum. A whiskey of mind-boggling duplicity, tricking the taste buds into reading one thing after another and then moving off on a different tangent altogether. About as complex and beguiling as straight Irish whiskey ever gets. Astonishing and truly a thing of beauty.